All the things you'll need to know to visit, to shop, to live in Oaxaca, Mexico! This is the place to find what you're looking for if it has anything to do with Oaxaca. Click the letter of the page you want to see next! Oaxaca is one of the world's treasures, a Mexican colonial city known the world over for its beauty, its crafts and its cuisine. To those who have visited the city it is beloved for its architectural and geographical beauty and for the warmth and charm of its people. In 1987, The United Nations Educational, Scientific and Cultural Organization (UNESCO) declared the City center of Oaxaca and the nearby archaeological site of Monte Albán to be a World Heritage Site for its historical and cultural value to humanity. It is not hard to understand why Oaxaca was included in this very distinguished group. 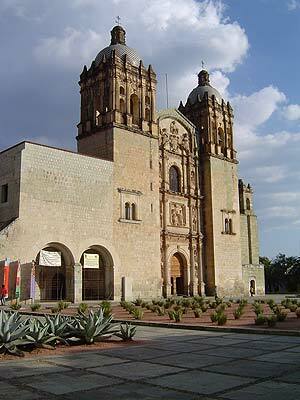 But Oaxaca is not just a pretty face. It has exceptional experiences waiting for everyone -- from art, architecture and archaeology, to cultural exchanges with indigenous communities living at some distance into the mountains, to explorations of some of the most biodiverse areas in the world. You may meet with a shaman and learn or experience ages old healing arts. And, you can hang glide or kayak or scuba dive in places that will seem untouched.